Berkwood Resources Ltd. (TSXV:BKR) (“Berkwood” or the “Company”)is pleased to announce that it has received exceptional, positive test results from initial metallurgical testing undertaken to evaluate whether the Lac Gueret South deposit is amenable to processing for the ready separation of graphite from the host rock. Berkwood Resources Ltd. (TSXV:BKR) (“Berkwood” or the “Company”)is pleased to announce that it has received exceptional, positive test results from initial metallurgical testing undertaken to evaluate whether the Lac Gueret South deposit is amenable to processing for the ready separation of graphite from the host rock. The work was carried out on two composite samples, each typical of a principal mineralogical association in the graphite bearing geological formations of the Gagnon Group. Metallurgical tests have demonstrated two highly desirable and advantageous features in the graphite concentrates produced. 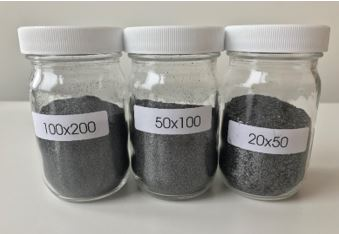 The first advantage is the high abundance of coarse graphite flakes recovered intact, and the second is high graphitic carbon grade of the concentrate produced. By completing this form, you are giving consent to receive communication from Berkwood Resources Ltd using the contact information you provide. And remember you can unsubscribe at any time. Of significance to Berkwood’s Lac Gueret South Project is the fact that Michel was cofounder, developer and metallurgist involved in the early stages of Quinto Exploration’s Graphite discovery now being put into production by Mason Graphite (TSX-LLG). Berkwood’s Lac Gueret South Graphite Project is located eight kilometers south of Mason Graphite’s project and shares an analogous geological environment, in an area where graphitic horizons range up to 40% Cgr (averaging 20.4% at Mason Graphite’s Lac Gueret Deposit) and flakes of up to 5 mm in diameter are exhibited. Large flake graphite is considered to be represented by flakes 0.3 mm in diameter and above. Click here to connect with Berkwood Resources Ltd. (TSXV:BKR) for an Investor Presentation.